The Greater Leander Chamber of Commerce was presented with second place for best website design and web development in the entire state of Texas in their category at the Texas Chamber of Commerce Executives 2012 conference held in Bastrop on June 25, 2012. Michele Schalin with Texas Best Chambers a division of Josiesque Designs designed Chamber’s website. 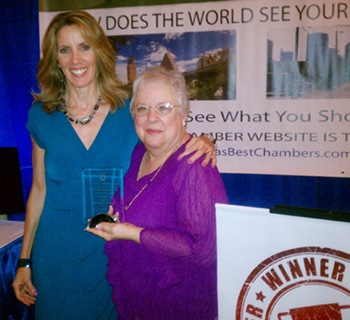 Pictured to the right are Michele Schalin (left) with Texas Best Chambers and Mary Bradshaw (right), the President of the Leander Chamber, together with the prestigious award.